Nine seasons in South America and five in North America. I have my Avalanche Level 3 and OEC. Skylar Holgate, Fabio Grasso, Aaron Brill, Reggie Crist, Tom Wayse, Scott Newsome to be honest this list goes on and on. Almost everyone I interact with in the mountains - coworkers, clients, and instructors - all influence me. My peers in general influence me to better myself all the time, and reflect on good and bad days. Self and group analysis of your time in the mountains helps you get better. If you're spending time in the mountains and you are not learning, than you're not paying attention. Participating in avalanche education courses, checking out new shredding zones, and reconnecting with the Utah Backcountry and snowboard community. 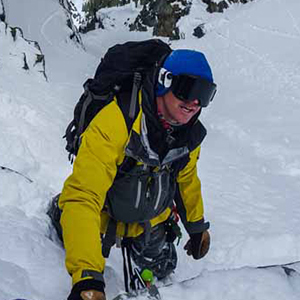 Spark R&D gear is light, durable, and works great in the harsh winter elements. It's easy to use making transitioning fast and intuitive. Spark R&D makes improvements on their products every season. It's truly been a pleasure and a life changing experience to use the Spark products the last ten years.